Relative strength price momentum is the beneficiary of the world's longest back test. 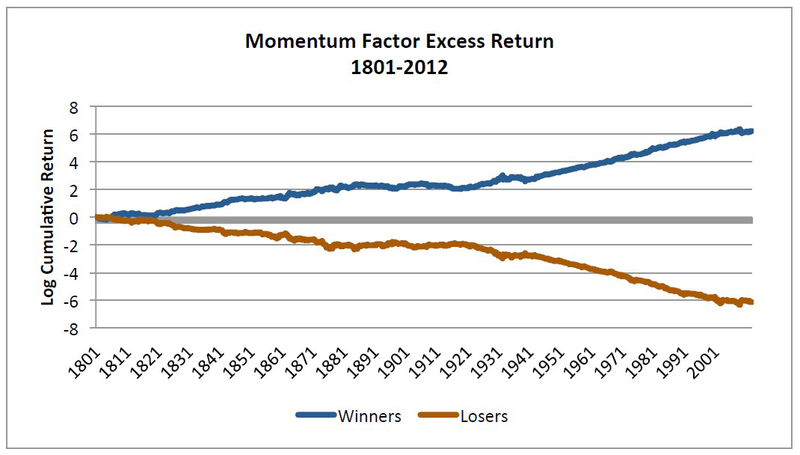 Geczy and Samonov just released a paper called 212 Years of Price Momentum (The World's Longest Backtest: 1801-2012). Previously, academic studies of U.S. stocks went back to 1926, when the CRSP database began. (Researchers have shown momentum to be effective in British stocks back to the 19th century). The first two U.S. stocks began trading in 1792. The authors were able to get data on 72 stocks by 1810 and on over 300 stocks by the end of the 1830's. The most important conclusion of this paper is that the momentum effect has remained statistically significant during 125 out-of-sample years from 1801 through 1926. These results, on more than twice the previous amount of available data, strengthen the evidence that the momentum effect is not a product of data mining. 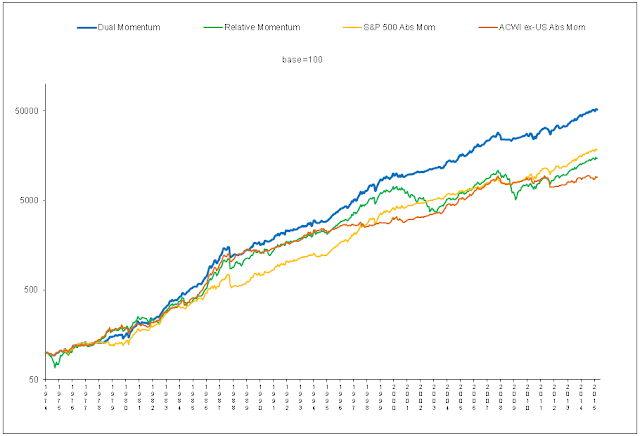 Specifically, a portfolio that is long the top third and short the bottom third of stocks based on 10 month momentum (prior 12 months of data skipping the last 2) shows an excess return (portfolio return minus the market return) of .4% per month (t-stat 4.5) over the last 212 years. Industry momentum is strong and significant as well, with an excess return of .4% per month (t-stat 3.1). 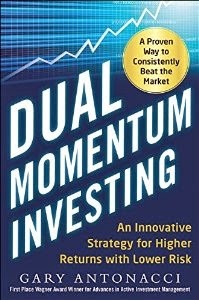 The authors use the same 10-month look back period to determine the state of the market. They find that beta is negative when the market state turns positive. They then see what happens if they dynamically hedge portfolio beta based on market state. This means adding positive beta when the market state turns positive, which is similar to using absolute momentum as a market-timing filter. Dynamic hedging increases long-only market excess return from .6% per month (t-stat 6.9) to .9% per month (t-stat 8.7). So there you have it. Relative strength price momentum has again shown its worth on a long out-of-sample data set. It now has the investment world's longest back test track record.